Ray is a Londoner and was a Westchester County and Rye resident for 23 years before moving to California. He started his love affair with Triathlon in 1995 at the Westchester Sprint Triathlon and has continued since then having completed 19 Ironman distance races including Kona. Ray introduced the sport to Rye residents in 2002 starting the first Rye YMCA Tri Class and then the Rye Y Tri Club. The club grew to over 150 with a majority non Rye Y members so in 2011 the club was reorganized as an independent 501c3 and became the Rye Tri Club, opening up to a more diverse geographic membership. Although now living in California, Ray continues to help steer the Club’s Mission Statement of inclusivity, to help all level of athlete, promote a healthy lifestyle and charity giving. Cathy and Mark live in Mount Vernon. Cathy has spent her career as a university administrator, now at Pace University where she helps new students transition from high school to college. Before work and after work Cathy helps aspiring triathletes become swimmers. A former college swimmer herself, and a current Level 1 and 2 U.S. Masters Swim Coach, some of her swimmers call Cathy “the Swim Whisperer” because of her ability to teach more efficient strokes and get them more comfortable in the open water. Cathy started triathlons at approximately age 50 and over the last 6 years has gradually moved from sprints to Olympics to 70.3s, participating in races in New York, New Jersey, Connecticut, Massachusetts, New Hampshire, Maine and Ohio. She has completed two marathons, three 70.3 IMs, numerous half marathons, and one century ride. Now Cathy recruits her swimmers to try triathlons, and many start by volunteering as her “Beach Angels” at the Westchester Triathlon where they see a triathlon up close and guide athletes from water to transition. Mark describes himself as an old swimmer with a fondness for cycling and an aversion to running. When the weather warms up, he works as a weekend kayak and stand-up paddle board instructor. Mark’s full-time gig is as an attorney in White Plains, primarily focusing on employment issues in the transportation industry. This includes serving as Assistant General Counsel for a maritime trade association and instructing groups of grouchy sea captains on sexual harassment prevention, having crew members pee in cups, and other enjoyable topics. Prior to law school, Mark spent many years working in advertising, mostly on the agency side of the business in account management roles. Now he also serves as the President of Pace Law School’s Alumni Association. I joined Rye Tri over ten years ago as a way to meet others who share my passions for physical fitness, open water swimming and goal achievement. It’s rewarding for me to give back and pay forward the coaching and mentorship that was given to me over the years. Hard training is a little more tolerable when you have the camaraderie of other like minded friends sweating along side of you. Lisa Dominici is a strategic leader whose 20-year career in the health information industry laid the foundation for her passion for health and fitness and the lifestyle they bring. An outdoor enthusiast and triathlete, Lisa has competed in many sprint, olympic, and half-ironman distance triathlons, Spartan races and half marathons. She loves open water swimming, ice-climbing, polar plunging, backpacking/camping, ultimate frisbee and always, hiking. An eternal optimist and kindness pusher, Lisa creates goals and works toward them, rain or shine. She loves to inspire others to do the same. In addition to her love of athletics, Lisa understands that giving is receiving. She is passionate about giving back to others and her community, and in addition to the Rye Tri Club, she serves on the Board of the Westchester Triathlon Committee, SOUL Ryeders Grants Committee, and is a member of the Women's club of Rye Children's Philanthropy. She co-created and co-chairs an annual breast cancer awareness campaign, which during the past 5 years has raised more than $100,000. Lisa currently is executive director of the Rye Youth Council, a local non-profit organization that supports and promotes the social and emotional health and mental well-being of children, teens and young adults in her community. She is mom to three amazing young adults, Chris, Brendan and Cat. I grew up in Rochester, NY, and went to college at the University of Minnesota. I majored in Spanish and ran Division 1 Cross Country & Track for the University. After college, I moved to NY and became a high school Spanish Teacher. I have been teaching for 19 years. I continued running recreationally for many years after college. In 2014, I joined the Rye Tri Club. I was new to triathlons, and the club helped me out tremendously. I attended all the Tuesday and Saturday rides. I also attended all the open water swims and the winter swim/spin classes. I wanted to give back to the club that has helped me so much. The secretary position was posted last year, so I decided to volunteer for it. It's been a wonderful experience, and I am very grateful to be able to give back to the club that I love being a part of. Lori Pitta - Treasurer and photo coming! I chose to be the bike captain because I feel everyone in the club should try and give back. Cycling is my strongest discipline and the one I feel the most confident. Ken Harris has done so much for all the members of the club as bike captain and I want to continue what he has done. 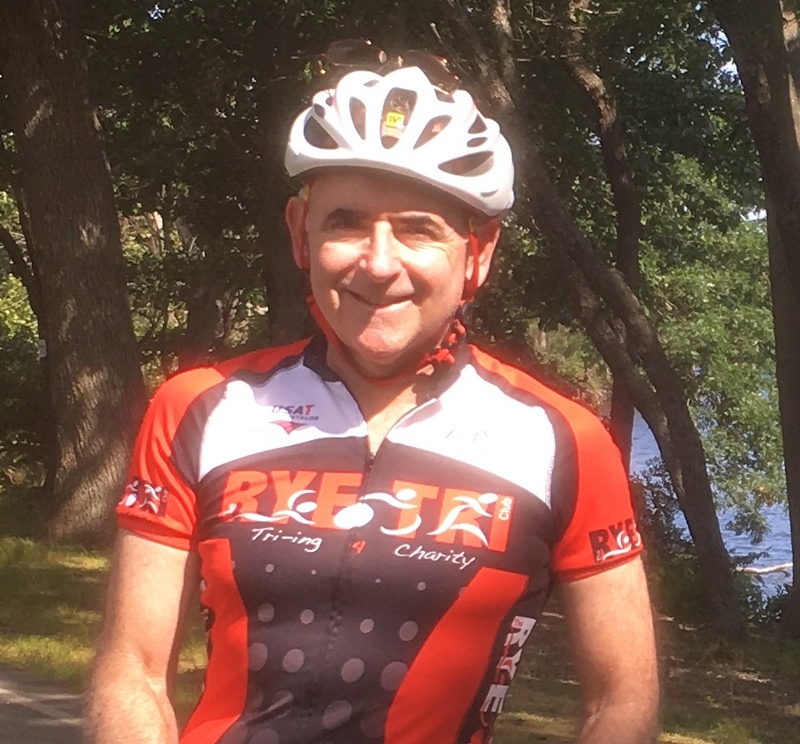 I am honored and grateful that members of Rye Tri thought of me as the next bike captain and I look forward to the challenges and memories we will all share.